1. 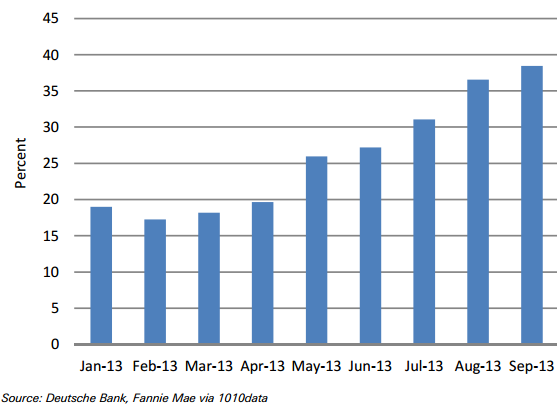 Refinancing activity continued to decline through Q3. The proportion of mortgage applications for purchase vs. refi has doubled this year (and that's not because of higher demand for homes). 2. A number of lenders who focused on mortgage refinancing such as US Bank, Provident Funding, and Flagstar are struggling (although the largest banks such as Chase and Wells seem to be less affected). This may result in an increase in the number of riskier mortgages. DB: - Lenders who specialized in refinancing transactions have experienced dramatic loss of market share and either will have to become more competitive on rates in growth sectors such as ARMs to regain market share or loosen credit standards. 3. While a larger number of buyers now prefer ARMs, the dynamic within the fixed rate universe is a greater demand for 30-year mortgages vs. 20 or 15. That's because the monthly payments on 30-year mortgages are lower (slower principal repayment) and buyers are looking for the cheapest solution. DB: - As interest rates have risen and volume has dropped, the product mix has shifted sharply ... 30-year mortgages are much more popular with homebuyers—more than 50% of 30-year mortgages are used for purchase transactions but less than 20% of shorter-term mortgages. As a consequence, the share of 15-year mortgages fell from 20% in September to 17% in October as the share of 30-year lending rose to 63% from 59%. Meanwhile, the ARM share has doubled to more than 5% since June as HARP’s share of lending has fallen to 3% from a high of 7% this spring. 4. As a result, MBS bond markets are taking a hit in the form of lower volumes. The sharp decline in refinancing activity has reduced the need to issue new agency mortgage bonds. 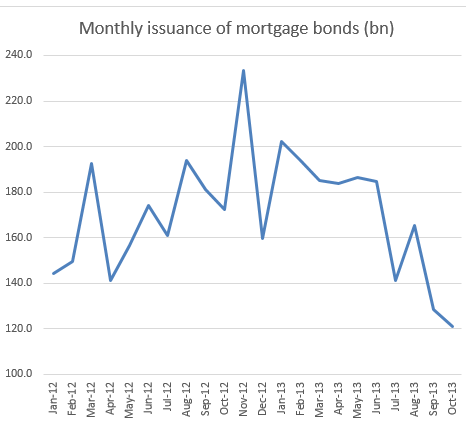 New issuance is the lowest in years. 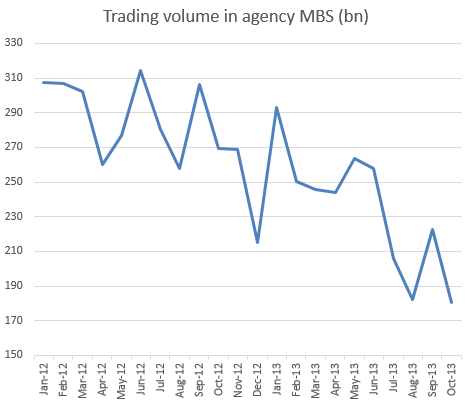 Similarly, trading volumes in MBS have dropped off to new lows. Frank Nothaft, Freddie Mac Chief Economist: - With the close of 2013 will also come a major transition in the housing finance industry. For the first time since 2000, we're going to see the mortgage market dominated by purchase activity as the refinance share drops below 50 percent. And with mortgage rates rising, we're also going to see the home-sales gains as well as the impressive house price growth begin to moderate to more sustainable levels.